Its time for us to jump into tech mood ! Swecha, in addition to our social commitment also takes up the responsibility of bridging the gap between academy and industry by conducting Workshops, Tech Conventions, Freedom Fests and Summer Camps since 2008 in numerous reputed institutions such as CBIT, KLU, IIT-Hyd, VR Siddhartha. Now it is Vizag's turn ! 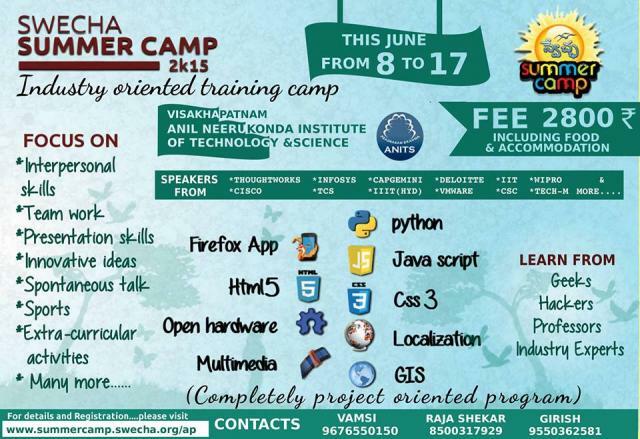 This year Swecha is conducting Swecha Summer Camp at ANITS from 8th to 17th June.